Just Buffalo teaching artist ADAM DRURY is a scholar, musician, activist, and sound/performance-based poet currently pursuing a PhD in English at SUNY, University at Buffalo. His writing has been published in The International Journal of Ẑiẑek Studies and Umbr(a): a journal of the unconscious. Not The Right Fit Where: Rust Belt Books 415 Grant Avenue Buffalo, NY Date: April 23, 2016 Time: 7:30 p.m.
“Borders and Boundaries” Taught by: Adam Drury, poet & musician Where: Just Buffalo Writing Center 468 Washington Street @ Mohawk, 2nd Floor Buffalo, NY 14203 Dates: November 22, 2016 Time: 4:30 p.m.–5:30 p.m. Experiments In Collaboration Taught by: Adam Drury, poet & musician Where: Just Buffalo Writing Center 468 Washington Street @ Mohawk, 2nd Floor Buffalo, NY 14203 Dates: February 21 & February 23, 2017 Time: 4:30 p.m.–5:30 p.m. 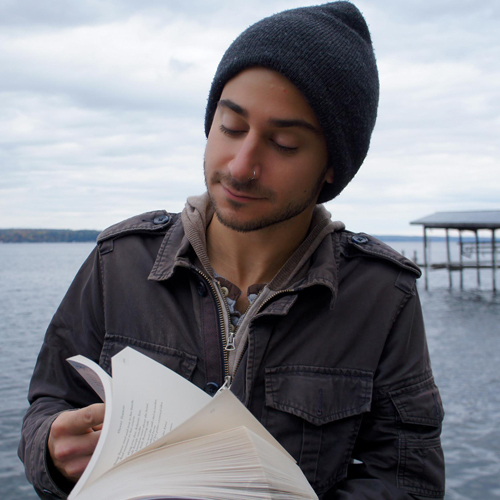 Experiments In Collaboration Taught by: Adam Drury, poet & musician Where: Just Buffalo Writing Center 468 Washington Street @ Mohawk, 2nd Floor Buffalo, NY 14203 Dates: February 28 & March 2, 2017 Time: 4:30 p.m.–5:30 p.m. Experiments In Collaboration Taught by: Adam Drury, poet & musician Where: Just Buffalo Writing Center 468 Washington Street @ Mohawk, 2nd Floor Buffalo, NY 14203 Dates: March 16, 2017 Time: 4:30 p.m.–5:30 p.m.
Collaborative Lottery Project Taught by: Adam Drury, poet & musician Where: Just Buffalo Writing Center 468 Washington Street @ Mohawk, 2nd Floor Buffalo, NY 14203 Dates: August 1 & August 3, 2017 Additional dates: August 8 & August 10, 2017 Time: 4:30 p.m.–5:30 p.m.
Collaborative Lottery Project Taught by: Adam Drury, poet & musician Where: Just Buffalo Writing Center 468 Washington Street @ Mohawk, 2nd Floor Buffalo, NY 14203 Dates: August 8 & August 10, 2017 Time: 4:30 p.m.–5:30 p.m. Led by: Adam Drury, writer & musician Where: Just Buffalo Writing Center 468 Washington Street @ Mohawk, 2nd Floor Buffalo, NY 14203 Dates: February 27 & March 1, 2018 Time: 4:30 p.m.–5:30 p.m. Led by: Adam Drury, writer & musician Where: Just Buffalo Writing Center 468 Washington Street @ Mohawk, 2nd Floor Buffalo, NY 14203 Dates: March 27 & March 29, 2018 Time: 4:30 p.m.–5:30 p.m.
Where: Buffalo And Erie County Public Library Central Library Reading Park 1 Lafayette Square Buffalo, NY 14203 Date: September 5, 2018 Time: 12:00-1:00 p.m.